The IDE2CF adapters are cost effective and easy to use adapters for connecting CompactFlash cards to the standard IDE port of your system. The adapters are build up in PC/104 form factor for an easy mechanical fastening. An optional stack through PC/104 connector for installing additional PC/104 cards is available. The adapters are electrically linked to the IDE port via standard IDE cable either, over the 44- pin 2 mm pitch or, the 40-pin 2.54 mm pitch header. 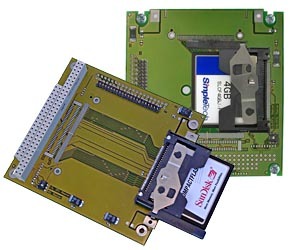 The IDE2CF adapter has 1 CompactFlash slot, fitting type I and II cards. So on the adapter any CompactFlash Storage Card can be used. With the IDE2CF adapter the storage cards are used like IDE hard disks, they are not hot plug capable. If you require hot plugging support, use the PCCARD Module of MPL AG. Card Types supported CompactFlash Storage Cards type I and II only Use the PCCARD Module for other card types! All Operating Systems that support IDE media will work with the IDE2CF. However, please note that Hot-Plug support for standard IDE media is not supported by most operating systems. For further customer specific versions, please contact MPL AG. For deployment in harsh environments, the IDE2CF can be ordered in an extended temperature version. Every system needs to pass various tests in a climate chamber to prove that it will perform flawless over the temperature range indicated.